Sudan has a rather well developed mobile market, with services of local operators being used by more than 77% of the population (with a population of about 42 million). The largest operators are Zain and MTN. Termination of MTN traffic is more valued by originators as they offer $0.1 per minute. 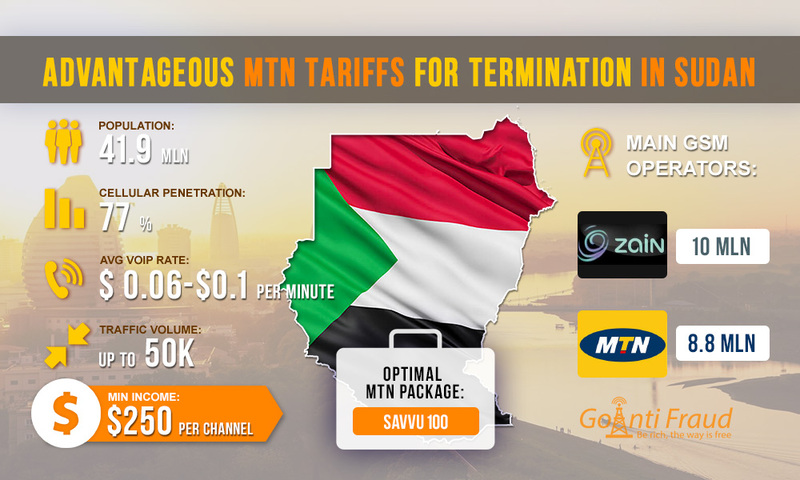 After you set up gsm termination system in Sudan, you can earn at least $250 per channel. MTN has more than 8.8 million connections, which allow terminating quite large amounts of traffic. In this case, in Sudan, there are inexpensive SIM-cards - a starter package will cost about 75 cents. SAVVU 30. For $4.5, the subscriber gets 400 minutes to make on-net calls. SAVVU 50. For $7.51 - 130 minutes to make on-net calls + 130 minutes to make calls to the numbers of other operators. SAVVU 100. For $15.02 - 270 minutes to make on-net calls + 270 minutes to make calls to the numbers of other operators. SAVVU 150. For $22.52 - 450 minutes to make on-net calls + 470 minutes to make calls to the numbers of other operators. SAVVU 200. For $ 30.03 - 400 minutes to make on-net calls + 400 minutes to make calls to the numbers of other operators + 3 gigabytes of mobile Internet. The optimal tariff plans for termination are SAVVU 30 and SAVVU 100. It all depends on which numbers you will redirect traffic to. With SAVVU 30, the cost of a local call is $0.01 per minute, with SAVVU 100 $0.05 per minute. Accordingly, using these packages, you can make from $300 to $850 via one channel of a 16-port dinstar gsm gateway or other VoIP equipment.